I think another name for this dish is called Waterfall beef. This beef salad is probably my very first taste of Thai food with Tom Yam Kung many many years ago when I went to Thailand on holiday, and I have been hooked on Thai food ever since. It is similar to Laab Nuea except for the roasted ground rice. The ground rice is essential to give that extra nutty flavour. Here is how I make this powder. 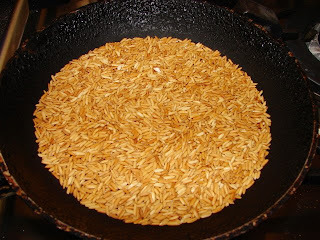 Take a handful of rice, preferably glutinous rice or Jasmine rice, add this to an old frying pan heat and stir regularly on a medium low heat for about 20 minutes till the rice is golden brown like this. Then leave the rice to cool down a bit. Ground with a mini blender or coffee grinder till very very fine like powder. If the ground rice is not powdery, it can be gritty and not very nice. The salad is simple just a typical Thai style dressing with herbs like coriander, Thai sweet basil or if you are lucky enough to get some saw tooth long leaf coriander, use that too. First prepare the ground rice. Then if you don’t have any ground roasted chilli powder. Take a small handful of dried Thai chillies de-stalked, deseeded and cut into 3 – 4 cm long and dry roast on an old frying pan stirring on medium low heat all the time till they have become very dark brown. Then ground in a coffee grinder or mini blender till powdery. Prepare the dressing. You can add the shallot/red onion to the dressing for 10 minutes to pickle the onion less sharp and pungent. Rub oil on the steak and chargrill till rare – medium rare. Leave to rest for few minutes then thinly sliced. Then plate up by mixing the salad leaves and spread on a large plate. 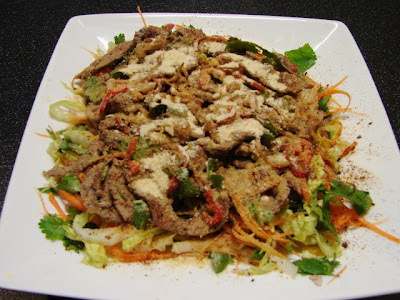 Then mix beef with dressing and pile on top of salad and sprinkle with ground chilli powder and ground rice. For a more traditional way to serve this beef salad, leave out the Chinese leaf and carrot, have it with steamed sticky rice and some raw cabbage and raw snake beans on the side. thanks for posting an authentic recipe! my mum makes this just the same, but when i asked for ingredients she told me what they were without measurements because she does it all to taste. can't wait to try this, i've been craving it like mad!